You can use the commands in this section to choose the kind of gallery you want to create, and specify some general settings for it. In a gallery of this type, the pictures and videos are shown sequentially, one after the other: the way in which pictures are displayed depends on the entry effect that has been set. The commands for passing from one picture to another are in the control bar. You can also have the thumbnails shown in the control bar, and these let visitors open a particular picture or video immediately, without going in sequence. In this type of gallery the thumbnails are displayed in the foreground above or below the picture. The thumbnails scroll left/right when the mouse is placed over them: clicking on a thumbnail opens the enlarged picture or video in the foreground. The enlarged pictures will appear with the entry effect that has been set for them. This gallery type is the same as the previous one, except that the thumbnails are displayed vertically, on the left or right of the picture in the foreground. This gallery also shows thumbnails and when one is clicked, the corresponding picture or video is opened in the foreground in the ShowBox. This gallery type is very similar to the previous one, with the only difference that you can divide the pictures into frames and specify how many rows of thumbnails to display. The visitor scrolls through the frames, using the button bar, and remains on the same website page. This gallery type is useful if you have a lot of pictures to include in your gallery. In this gallery type, the thumbnails are displayed in a single horizontal row. The picture or video selected from the thumbnails is displayed in the ShowBox. This option is the same as the previous one, except that the thumbnails are displayed vertically. 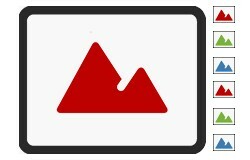 The various gallery types have differing Settings and options for their Navigation Commands. ▪ Maximum size: defines the maximum width and height, in pixels, of the pictures. Leave the Keep Ratio selected to keep the ratio between width and height. 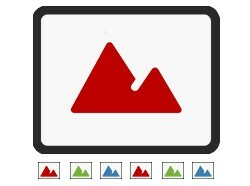 ▪ Visible Thumbnails: sets the number of thumbnails to display next to the main picture. ▪ Thumbnails position: defines where the thumbnails are displayed. ▪ Description Font: specifies the font, style and size to use for the text. The menu shows the command for applying the Default Font (defined by the style of the Page Text item in the Text Style window), the list of safe fonts (those which are present on all devices and do not need to be published, and all the Google fonts and web fonts added in the Add web fonts window, which is opened by the Other font types command. These settings are used for the captions you can create in the Description field in the List section. ▪ Soundtrack: specifies the audio file (in .MP3 format) to be used for the soundtrack that plays when the gallery is displayed. ▪ Autoplay: the picture and video Slideshow starts as soon as the gallery opens. ▪ Random View: the pictures and videos are shown in a random order, and not in the sequence they are added. 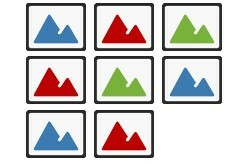 ▪ Rows per frame: defines the number of rows in which the thumbnails are organized. ▪ Show description on mouseover: when the mouse passes over a thumbnail, a tooltip displays the description (defined in the List section) of the image or video in the thumbnail. You can define the tooltip's style in the Tooltip on mouse over window. ▪ Display enlarged image on click in ShowBox: creates the link on the thumbnails so that the corresponding picture or video is displayed in the ShowBox. ▪ Maximum size: this is only available if the Display enlarged image on click in ShowBox option is active: it defines the maximum width and height, in pixels, of the ShowBox window. Leave the Keep Ratio selected to keep the ratio between width and height. ▪ Show thumbnails in the ShowBox: this is enabled by default. It adds a list of thumbnails of the images and videos in the gallery to the ShowBox window. Visitors can choose which one they want to look at, without having to go through them all in sequential order. ▪ Buttons Style: select this option to define the style of the buttons that appear on the side of the main image in the gallery. ▪ Buttons View: defines whether and how the navigation buttons are to be shown next to the main picture in the gallery, to pass to the next/previous picture. The buttons can be Always visible, Not visible (autoplay) or Visible on mouse over. ▪ Buttons Style: you can choose the style of the buttons that are shown next to the gallery's main picture. ▪ Show Control Bar: this is active by default: a control bar appears on mouseover showing the controls to use for looking through the pictures and videos in the gallery. The basic controls are Start Slideshow, Previous picture and Next picture. ▪ Color: specifies the background color of the control bar. ▪ Enable Full Screen view: adds the button to the control bar that appears on mouseover: when the visitor clicks on this button the gallery is shown in full screen, completely filling the browser window. ▪ Show Thumbnails in the Control Bar: this is active by default: it adds a list of thumbnails of the pictures in the gallery to the control bar, that is displayed on mouseover. The visitor doesn't have to follow the sequence of the Slideshow, but can pick out the pictures or videos that he wants to see. 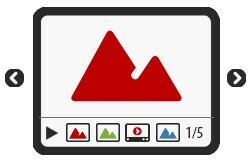 ▪ Show Navigation Bullets: a graphic indicator is displayed over the gallery that shows the user the number and/or position of the pictures that make up the image. ▪ Buttons Style: this option can be selected if you have selected the Show Navigation Bullets option, and you can now choose the appearance of the graphics indicator. ▪ Alignment: this option is available when you select the Show Navigation Bullets option, and you can choose the indicator's alignment.